It seems not many women lived in Grand Junction in its earliest years. In 1882 and 1883, women were scarce enough that the Grand Junction News often remarked when the wife of a man joined him here in town. The News also occasionally noted when a single woman passed through, as it did with Miss Julia Wilson, assuring readers that Grand Junction’s “gallant beaux” would “regret her departure,” when she returned to Robideaux’s Ford (January 6, 1883. p3, c2). Another blurb in the same Local Affairs section mentioned that a Mrs. J.V.B. Jackson and her daughter, “Miss Kate,” were the “only ladies who received calls from their gentlemen friends” on New Year’s Day, a sure sign that the men of Grand Junction were hard-pressed to find a companion… at least a legal one. On November 18, 1882, the News mentioned the anticipated arrival of “quite a number of young ladies” for the winter. Could this be a veiled reference to prostitution? The world’s oldest profession was alive and well in our town by 1883, as an article about a saloon shooting on Colorado Avenue evidences. 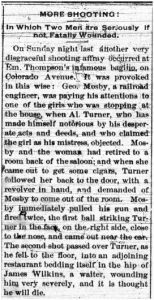 A man named George Mosby retired to a back room with “one of the girls who was stopping by the house.” Al Turner objected that the woman was “his mistress,” pulled his gun, and was shot by Mosby. Women played an important part in Grand Junction’s early history. They organized for the Christmas pageant and other community events. They taught in the first school. The problem was (for the men, in any case), there do not seem to have been enough women for all the men in town; at least not the marrying type. Still, community-minded citizens did their best to initiate relationships between the sexes, throwing dances and, in one case, something called a “basket social,” which the News referred to as a “chance for our old bachelors” (February 10, 1883. p3). It’s amazing what great stories are hinted at in those terse newspaper lines. Your examples are just the kind of mental picture that speaks a thousand words…. Perhaps a book? Thank you very much for your comment. It does take a small amount of conjecture, but it’s easy to read between the lines. Noel, I really appreciate all this fascinating town history you are digging up. Who knew?! I’m sure this history has all been written about in books on Grand Junction, but it is new to me, and I thought it might be new and interesting to others too. Thanks!